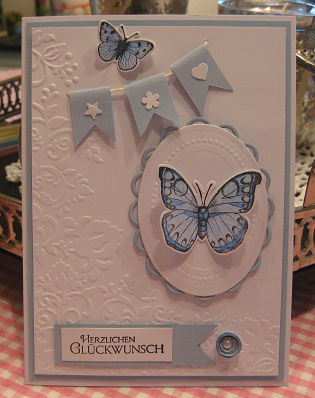 Gorgeous card, great design - especially the bunting and the butterflies. This is a great CAS card in great colors. Thanks for sharing your gorgeous card with us. The lovely touches of blue against the white embossed and plain areas really stand out. Beautiful! Beautiful card with soft color blue. Thanks for joining us at Fashionista Challenge. What a pretty card. Love the pale blue you have used. And a great layout with the banners & butterfly. Beautiful card, super details. Thank you for joining us at CCM this time. Beautiful card! I love your fab bunting and lovely butterfly :) Thanks so much for joining us at Crafty Cardmakers for our Birthday challenge. I love these butterfly stamps and the colours you have used are so pretty. Thanks for joining us at Crafty Boots Challenge this time. This is beautiful. Love the blue and white combo. Thanks for sharing at Craft Your Passion. Hope to see you again! Beautiful card! Love the butterflies! Thank you for linking up with us for Tara's linky party at Craftin Desert Diva's We hope that you will join us again for the next linky party! Awesome card! Thank you for joining us at Fashionista Challenge!